Duncan: [to Marian] He fancies you, my lady. I am blind, but there are some things I can still see. Duncan: Point me towards danger, Azeem, I'm ready! Friar Tuck: Come on, get out of it. We waste good celebration time. Maid Marian: Men speak conveniently of love when it their serves their purpose. And when it doesn't, it a burden to them. 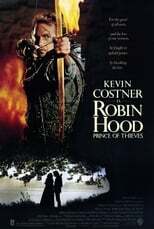 Robin of the Hood, prince of thieves. Is he capable of love? Will Scarlet: [after Robin and Azeem are successfully catapulted over a wall] **** me, he cleared it! Azeem: In my dreams alone have I imagined such a place. Robin of Locksley: Then imagine a way to cross it. Azeem: No man controls my destiny... especially not one who attacks with down wind stinks of garlic. Robin of Locksley: Come, Azeem, our fighting days are done. By nightfall, we'll celebrate with my father. You'll understand of course, I had to try. Azeem: I would have succeeded. <hr width="50%"/ Azeem: In my country, we talk to our women. We do not drug them with plants. Robin of Locksley: What do you know about women? Azeem: Where I come from, Christian, there are women of such beauty, that they can posess a man's mind so, that he be willing to die for them. Robin of Locksley: Wait a minute. Was that why you were to be executed? Because of a woman? That's it, isn't it? That's it? Robin of Locksley: You painted old hound, who was she? The mullah's daughter? Another man's wife? What's her name? Robin of Locksley: Her name. Robin of Locksley: [points] That way. Azeem: Did God paint me? [laughs] Most certainly. Azeem: Because Allah loves wonderous varieties. Bishop of Hereford: It's rebellion, my lord. We must escape. Sheriff of Nottingham: Marry us! Maid Marian: I will never marry you! Sheriff of Nottingham: That's my wife, crone! Mortianna: She is ripe. She will give us a son. You must take her now. Sheriff of Nottingham: I will not take her until we are properly wed! For once in my life, I will have something pure. Will you stop interfering? Bishop of Hereford: It's madness to delay. Mortianna: Marry them or face me! Duncan: A curse on Moors and Saracens! If it were not for their ungodly ways, Master Robin would never have left home. What manner of name is "Azeem"? Irish? Cornish? Sir Guy of Gisborne: Friar! I'm sure you shall find it much more difficult to sing with a sword in your gullet! Friar Tuck: Yes, my lord. [laughs, to himself] You pig. Friar Tuck: Come, my barbarian friend. Let us open a bottle and do our best to save each other's souls. Friat Tuck: Fine then, you talk, I'll drink. King Richard: I will not allow this wedding to proceed! Robin of Locksley: My lord! King Richard: Unless, I'm allowed to give the bride away! You look radiant, cousin. Robin of Locksley: I am deeply honored, Your Majesty. King Richard: It is I who am honored, Lord Locksley. Thanks to you, I still have the throne. Friar, proceed! Maid Marian: How is it, that a once-arrogant young nobleman has found contentment, living rough with the salt of the earth? Robin of Locksley: I've seen knights in armor panic at the first hint of battle. And I've seen the lowliest, unarmed squire pull a spear from his own body to defend a dying horse. Nobility is not a birthright. It's defined by one's actions. Maid Marian: It's interesting to hear you say that. Robin of Locksley: I didn't. My father did. Maid Marian: Did the holy quest erase your hatred of him? Robin of Locksley: I don't know. All I know is that our last words in this world were spoken in anger. I was lost after my mother died. My father too, and for a short time he found comfort in the arms of another woman, a peasant woman. I thought he was betraying my mother's memory. Maid Marian: So he gave her up? Robin of Locksley: For the love of a twelve-year-old by who would never forgive him. Maid Marian: Stop them! They're stealing my horses! Robin of Locksley: You're so kind, Marian. Sir Guy of Gisborne: Have you been sheltering outlaws, Lady Marian? Maid Marian: They are thieves, you imbecile! Sir Guy of Gisborne: Lucky they didn't steal your virtue as well. The crown for the man who brings me Locksley's head, my lady!